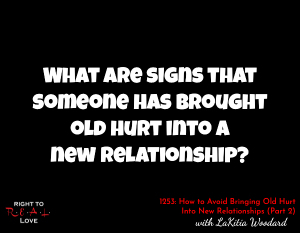 In this episode, Yahnathan continues his discussion with author LaKitia Woodard by addressing the question: What are signs that someone has brought old hurt into a new relationship? What are signs that someone has brought old hurt into a new relationship? Why some people ignore the hurt they experience. How knowing the Most High will enable us to truly know ourselves. How old hurt can hinder our ability to grow. What is required to avoid bringing old hurt into new relationships. LaKitia explains why she finds joy in helping other women by sharing her experiences with them.